Why are you wanting the dried flowers? To decorate the cage? If so, it would be better to use silk with plastic stems. The ones without wire in them. If you are wanting to feed them to gliders, then fresh is definitely better. 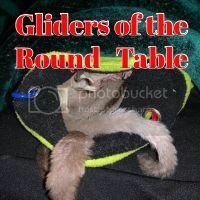 Both Exotic Nutrition and The Pet Glider have dried flowers that are safe. You can also find them on The Pampered Glider's Etsy store. Mine really like the dried carnations and rose petals, as well as dried hibiscus. I don't know how much of them they actually eat, but they love chewing and tearing them apart and strewing them around cage and tent! My guys love chewing up eucalyptus. I cleaned it up once and then came out the next day to find the boy’s cage covered with leaves. I could not figure it out until I checked their pouch. I was doing pouch swapping in prep for intros and the girls had put a lot of it in their pouch at potpourri I guess and the boys were having none of that and dragged it all back out.